On or after the first day of class, you'll want to explore some of the features of the site. This document gives an overview of a few features you might want to take a look at that will help you to navigate the site. Once you've logged in to the site, you'll also find one or more "blocks" that contain additional site navigation or other content boxes. These boxes may be located on the left or the right side of the page, depending on the site's design. From here you can post to your individual blog ("blog post") or the front page (called an "article"). Lists all the blogs on the site and includes a direct link to your blog in its submenu. Compose tips takes you to a page that walks you through various methods of posting content to the site. This display allows you to access all of the recent content posted by everyone. 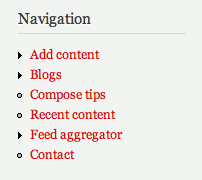 In the content listing, the red asterisks denote pages you have yet to read and notices of new unread comments. Feed aggregator collects (via RSS feeds) content that has been published elsewhere and may relate to course content. There may be a few blocks on the front page that include feed summaries. All course materials on the site are integrated into the course guide, which you can reach via the main menu bar near the top of the page. The course guide is a hypertext with many levels of pages. You can use the book navigation links that show previous and next pages below the main text or use the breadcrumb navigation at the top. 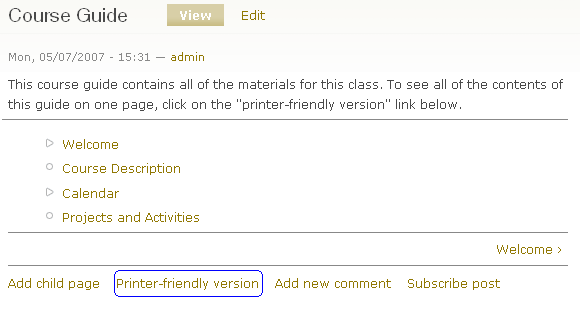 Use the printer-friendly version link beneath any page to get single-page version of that page and all of its subpages collated into one. For example, if you go to the top page of the guide and click on printer-friendly version, you will see the entire course guide, including the calendar, handouts, project descriptions and more all on one screen (a very long one).